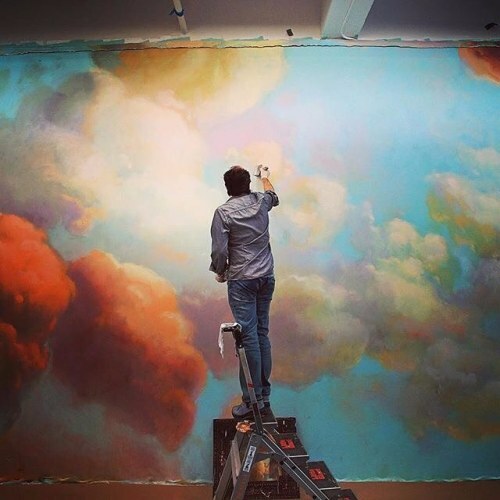 "Zinni Veshi of @evergreene_arch_arts worked on a ceiling mural that will replace the lovely cloudscapes in the main reading room of the @nypl's Stephen A. Schwarzman Building on Fifth Avenue. "We study the artist," said Zinni, the lead muralist. "We study the period." Spirit matters as much as details, which are lost to history anyway. "It's not a matter of imitation but connection," he said. The reading room — arguably the hub of humanities research in New York, and no small tourist attraction — and an adjoining room have been closed since May 2014, when a plaster rosette 16 inches in diameter dropped from the ornate ceiling in the reading room. Both are to reopen in the fall after more than two years. Follow @bengiville, a @nytimes staff photographer, to see more photos of the muralists at work. #regram" By nytimes on Instagram.